1) Chill the Vinho Verde. 2) Pack the kids off to grandma’s, or distract them with a movie, in a darkened room. 3) Head out to the garden. Stop to smell the roses. Get distracted by the hammock. Lie down, for just a minute. 4) Take a nap, or not. 5) Remember your original objective. Return to the vegetable garden. 6) Marvel at the size of the zucchini. Decide not to pick one, just to see how big it will get. 7) Tomatoes! Pull out the ripe ones, testing each one for weight and ease of separation. Peer into the cool depths of the tomato patch. Don’t miss any! 8) Eat one of the cherry tomatoes, just because you can’t resist. Let the sun-warmed fruit pop in your mouth. Eat one of the heirlooms like an apple. Breathe in the scent of the tomato vines. 9) Return to the hammock. Eat another tomato, then another. 10) Take your bounty to the kitchen. Turn on some mellow music. Get out a big bowl. 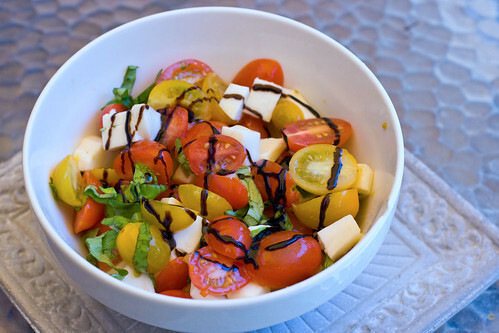 12) Take a lump of fresh mozzarella out of the refrigerator. Chop it into cubes; throw it into the bowl. Some caprese salads are stacked, but who has time for that fussiness? 13) Pull a few sprigs of basil from your windowsill garden. Crush them lightly in your fingers, and take a deep breath. Wrap the basil leaves into a neat package, then sliver it into ribbons. Add to your bowl. 14) Humming a little, pull out the good olive oil. No not that bottle, the GOOD one. Drizzle it over your tomatoes. Add a sprinkling of sea salt. 15) Dig your fingers into the bowl, and gently toss your salad. Find a big spoon. 16) Grab a couple of pretty plates, a couple of pretty napkins. Take them out onto the shady deck, and set the table. Fold the napkins in half to serve as makeshift placemats. 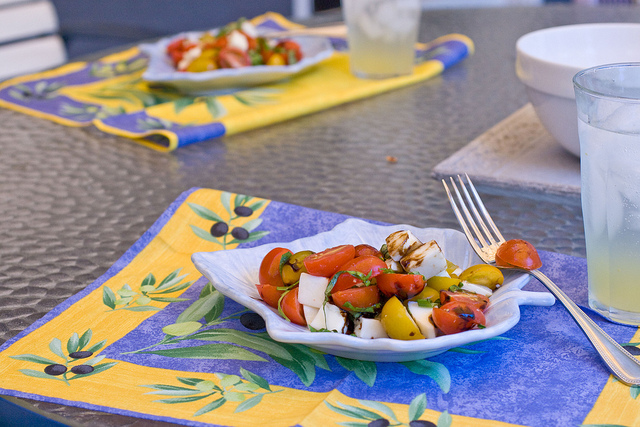 17) Drizzle a little balsamic vinegar over your salad, and bring it out to the deck with a couple of tall glasses of lemonade, cut with fizzy water. Call your spouse. 18) Eat, enjoy, talk, laze. Hear the humming of the bees, feel the warmth of the day, taste the creamy cheese with the sweet and sour tomatoes. Kiss your spouse. Live in the moment. 19) Remember the wine. Pour yourself a glass. Share it. Finish the bottle. That sounds like a perfect summer afternoon! You really nailed how to do summer. What a refreshing post!